Lungomare! 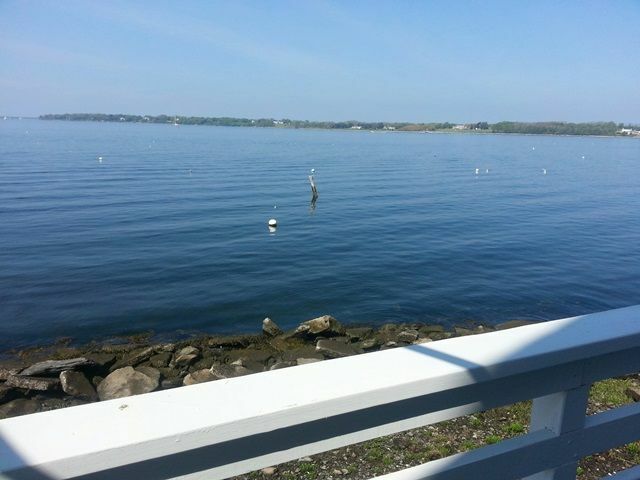 Recentemente ristrutturato 4 camere da letto, 3 bagno di casa si trova proprio sulle rive del Narragansett Bay, adiacente ad un piccolo porticciolo. L'acqua vista da ogni finestra, due ponti. Completamente applianced cucina, lavatrice e asciugatrice, AC, Wi-Fi, TV via cavo, Getti in bagno master, grill a gas. Litorale piccola spiaggia privata. Ormeggi e spazio dock anche disponibile. Peacock Alley House si trova a soli 2 isolati a piedi a ristoranti del centro, boutique, gallerie d'arte e altri servizi e attrazioni. Noleggio biciclette e kayak sono disponibili a pochi passi. Bristol è la patria di Roger Williams University e ha una popolazione eclettico e vario. Adiacente al PAH è la tenda del luogo dei musei che a volte viene usata nei fine settimana per i matrimoni. Pertanto, gli ospiti sono invitati a mantenere l'unità in modo chiaro per l'accesso. The house and views were wonderful! The kitchen was fully stocked with everything we needed and there were also plenty of sheets of towels. The house and views were a beautiful backdrop for our wedding. We got married at the museum and it really helped to have this house reserved throughout the weekend! I got ready here and then we didn't have to worry about transportation to get to the wedding. Plus we got the enjoy the venue even more! The house itself is well kept and gorgeous, with tons of room for you and your bridal party as well as an afterparty once the wedding finishes. Highly recommend. We also enjoyed the jacuzzi tub ;) Thank you! We really enjoyed our stay at the Peacock Alley house. The house is well maintained with beautiful views of Bristol Harbour. Highly recommended. This is the second time we have stayed at Peacock Alley. The home is amazing; spacious and clean with great water views. We loved sitting out on the large deck. We plan on renting again! We rented this house the weekend of my wedding at the Herreshoff. It couldn't have been more perfect! Very clean and gorgeous inside with a huge open floorplan on the main level, which was perfect for getting ready on the wedding day. We were able to enjoy the amazing waterfront views from the two balconies off the house. The house was fully stocked with plenty of extra linens and your basic toiletries. My family loved our experience and my husband and I are already talking about coming back to rent it again for an anniversary :). The staff was great to work with as well! Easy check-in and check-out and very accommodating when I asked for early check-in as well as when we needed to store a few wedding items in the basement until someone could come pick them up (which was past check-out time). Can't wait to come back! Beautiful home and beautiful location. We rented this home while attending a family member's wedding. The location is great. Close to Providence and Newport (the only two places we visited). We had an infant with us so strolling a couple blocks for a nice breakfast/lunch/ shopping was enjoyable and convenient. The house has everything you need so don't bother to pack laundry supplies/ dish soap/ coffee filters, etc. Everything you need is probably there. :-) We would definitely return if visiting that part of the country again. The Peacock Alley House al Museo Herreshoff si trova nel centro storico di Bristol, RI, un affascinante cittadina coloniale boatbuilding iconico alberato, e conosciuto a livello nazionale come la sede del più antico continuamente in esecuzione 4 luglio parata America. L'intera zona del centro in cui si trova Peacock Alley è un quartiere storico registro nazionale, ed è pieno di coloniale e case federali dell'epoca, grandi alberi, boutique e gallerie stravaganti e uniche esperienze di percorso off-the-battuti. Le attrazioni locali includono il Museo Herreshoff, Blithewold Mansion e Arboretum, Linden Place Museum, Mt. Speranza Farm, La Audobon Società Preserve, Museo Haffenreffer, Colt State Park, Prudence Island, Roger Williams University e la vicina città di Newport, alias la capitale della vela del mondo. There is a fee of $50 for lost key which will be deducted from the damage protection.